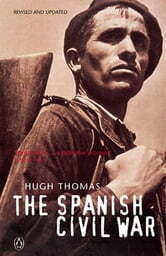 Though more than half a century has passed since the Spaish Civil War began in 1936, it is still the subject of intense controversy. What was it that roused left wing sympathisers from all over the world to fight for a cause for which their governments would not give active support? In his famous history, Hugh Thomas presents an objective analysis of a conflict - where fascism and democracy, communism and Christianity, centralism and regionalism were all at stake - and which was a much an international civil war as a Spanish one.